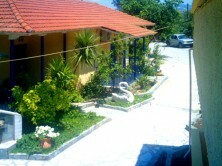 The studios called “Faros” are quietly located in a huge land with lots of trees in Alexandros’ salt lakes in Kariotes. The small village of Kariotes with a lot of fish taverns and mini markets is only 5 km away from the town of Lefkas and 15 km away from Nidri. The main road and bus stop to the town is only 200 meters from “Faros”. During summer there is bus service very often. The quiet sandy beach below is less than 100 meters.